There always comes a time during the summer when I start to crave fall. It’s less about the weather—because I could easily live in a world where long sunny days happened year round—and more about the clothes. With a new season on the horizon and a new drop of trends and designer pieces that come with that, I always feel a fresh wave of inspiration. This time around, I feel particularly full of ideas. I headed to Paris fashion week for the first time last season, and sitting there in the audience at shows like Isabel Marant, Chanel, and Off-White, I grew inspired by everything on the runway and couldn’t wait to wear the pieces for myself. That being said, I’ve documented my proclivity for classic style with a modern twist, so my adoption of new trends is always measured. My trick is to always have a mix of trend-forward pieces, as well as some seasonless staples. Ahead I’m breaking down all the pieces on my shopping list that will tap into my classic style for fall. Animal prints are everywhere for fall. 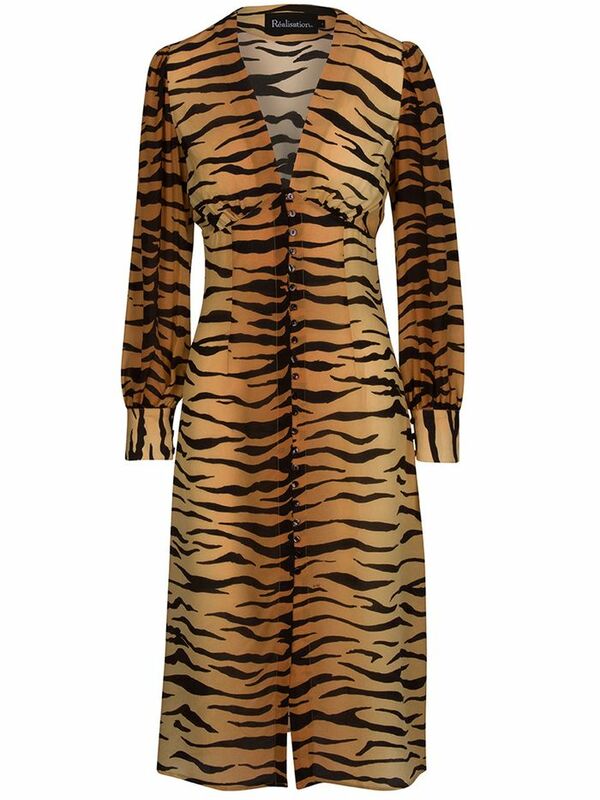 And while leopard is already a staple in my wardrobe, I’ll be adding tiger prints in as well. For me, the key to pulling it off is finding it in a piece like this with classic lines. Clearly, I’m really embracing the animal-print trend for fall. I would style this zebra coat with solid colors with clean lines. Slouchy boots are back, my friends. Pair with a long dress or skirt. This is less of a forward trend and more of an essential fall staple. A short sleeve makes this the perfect transitional piece. Sleek, shiny pieces are having a moment for fall. I love this take on a classic pencil skirt that has a few modern tweaks like a faux-patent finish and a front slit. Available in British sizes 6 to 14. Ever since I watched the Isabel Marant runway show in Paris, I’ve been wanting to get my hands on a pair of cowboy boots—and all things Western. Net-a-Porter noted that “Rejina Pyo romanticized about a time when a woman’s wardrobe was made up of beautiful hand-me-down pieces,” and this croc bag is designed with this in mind. Here’s a truly classic piece I would wear for years and years—and maybe pass down myself. From Balenciaga to Chloé, chain necklaces were everywhere. I’ll be throwing one on over a turtleneck. Hemlines seem to be growing longer and longer each season. This style is perfect for fall parties. For fall, pumps are making a comeback but getting a revamp. There’s a new crop of styles with revised silhouettes and updated materials—like this cool woven style. I’ll be pairing these with an ankle-grazing dress or jeans and a crisp button-down. Pastel hues continue to be big for fall. I’m particularly drawn to colors like this baby blue, which I can wear season after season. Plus, I’m obsessed with this square neckline. Available in sizes 32 to 44. Slip skirts have one of the It pieces this summer, but for fall I'll be wearing one in a fun pastel shade with ankle boots. It may sound counterintuitive to buy jeans in a light ivory wash, but nothing feels more fall to me than warm tones. Last fall was all about the plaid blazer, but now there are new iterations with pieces like these tweed ankle boots. Next: Five easy ways to master NYC-girl style.